To delete the older Windows installation folder you will have to let windows know that its older installation and clean it using disk cleanup. Rename the older Windows installation folder to Windows.oldNow run the disk clean up by right clicking the drive where the old Windows folder exists.During disk cleanup select clear system files.Now it will detect that there is old Windows folder which can be cleaned.Select the Older Windows installation files and complete the disk clean up. The Windows.old folder will get deleted automatically. 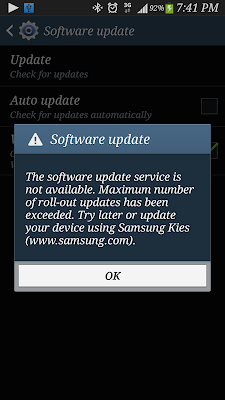 You may get error "maximum number of update rollouts reached" while updating your Galaxy S4 over the phone. If this error appears frequently then install Samsung Kies on you computer/laptop and then try to update the device software. Once you install the Kies on your PC, connect the mobile to PC. If Kies successfully connects to your device then it will automatically detect the software version on the device and if update is required it will prompt your for the device software update. If you are seeing duplicate images or videos in gallery of your Samsung Galaxy S4 or any other Android 4.2.2 running device, then you can easily clean up those with a simple trick. Go to Settings -> More -> Application Manager. Under All Applications, select for Gallery app. Now click on "Clear Cache" and then "Clear Data". Follow similar steps for the Media Storage app as well. Now restart your mobile. Once restart complete, wait for some time so that media service will search for the images, video and other media sources. Now open the Gallery application, all the duplicate images, videos should disappear. Note: Make sure you backup your data and application before using steps below, as hard reset will result completely wipe your data and applications.Also make sure you have your phone battery fully charged. There are multiple ways to hard reset your Galaxy S4. Using factory reset option Go to System -> Account -> Backup and Reset -> Factory data reset -> Reset Device -> Erase everything on your mobile. Note: Please make sure that you back up your data and application before using these steps. Using below steps might result in to full wipe or data loss. Use at your own risk. Power off your Samsung Galaxy S4.Press and Hold VOLUME UP, HOME button and keep pressing POWER button until phone vibrates.Wait until you see the Android logo and release all buttons. Keep pressing power button after vibrate might restart your mobile as default option on recovery screen. You should see below screen once you enter the recovery mode. 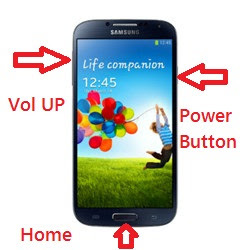 Use volume up & down button to select the available options and press power button to choose the option. If the SSL certificate on the perforce serve is changed then you may get error "Unable to connect to server. Remove SSL protocol prefix from P4PORT" while launching the perforce client. In order to resolve this error you will have to remove the certificate stored on the client and also remove the perforce ticket stored under user settings directory. Capture Screen using Palm motion: With Samsung Galaxy S4 you can capture the screenshot using the motion and gestures of the palm. To enable the motion and gesture follow below steps. On your Samsung Galaxy S4 go to Settings -> My device.On My device select Motion and gestures.Under Motion and gesture page enable and select Palm motions.Under Palm motion enable Capture Screen option. Now you can take the screenshot using your palm motion. Once you have enabled the palm motion, click on palm motion option, will launch the tutorial of how to capture the screen using palm motion. Alternatively you can take the screenshot by pressing Power + Home button simultaneously. 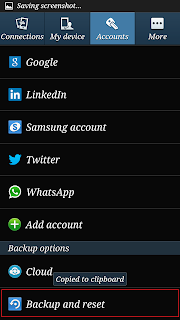 Samsung Galaxy S4 does not provide direct shortcut to use 2G data network as shown in below settings, as like other mobiles. 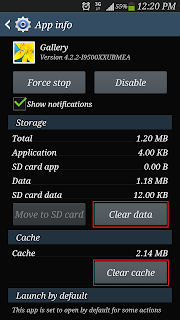 To use the 2G mobile data network on Samsung Galaxy S4 you will have to follow below steps. On your Samsung Galaxy S4, go to Settings and select More network.Under Wireless and Network settings, select Mobile networks.On Mobile Networks setting page click select the Network Mode setting.On Network mode dialog you may find below choicesWCDMA/GSM ( auto connect ) : To choose any available 3G/2G networkWCDMA only : Use 3G only networkGSM only : Use 2G only network From the available Network mode choose GSM only mode, this will allow you to use only 2G network and not 3G.